Mom has finally let go of the pillow. She doesn’t need it anymore. Jane Elizabeth Tracy died Monday afternoon, peacefully, almost blissfully, surrounded by family who loved her deeply. For the past 10 years she has clung to a star-shaped throw pillow that belonged to her youngest son, Joseph. That threadbare pillow had belonged to him; it was a security blanket of sorts to help him through his dying days. Mom clung to that pillow as to Joe’s very soul. Back surgery five years ago limited her mobility. She spent a lot of time in a comfortable glider chair suffering along with her Philadelphia Phillies, watching the movies of her youth on the TCM channel, all the while fondling Joe’s pillow and looking up at a picture of him that watched over her. It comforts me to think she’s now in a place where she can cling to Joe instead of his pillow. Born Jane Elizabeth Cullinan on a spring day of 1926, she was a child of the Great Depression growing up in southwest Philadelphia. Her father, Cornelius Cullinan, was a pipefitter and an emotional man given to drink and sometimes violent outbursts. Mom would scream out the window calling for the police when he attacked her mother, and then she’d join in the fray going after him to protect her mother. There was one Christmas, she told me, when her uncle had come into some money and provided gifts, a “real Christmas” for her and her brothers and sister. Probably because of that, Mom’s children never knew a Christmas that was not grand with the fulfilled dreams of childhood. We got what we asked for, and we never had to wonder if it would happen. Devoted as she was to family and comforting others, she had a vein of solitariness deep within. She talked of going to movies alone as a child, of spending time alone in the park along Cobbs Creek. I think that solitary vein helped her in the aloneness of the last eight years since her husband, William died. 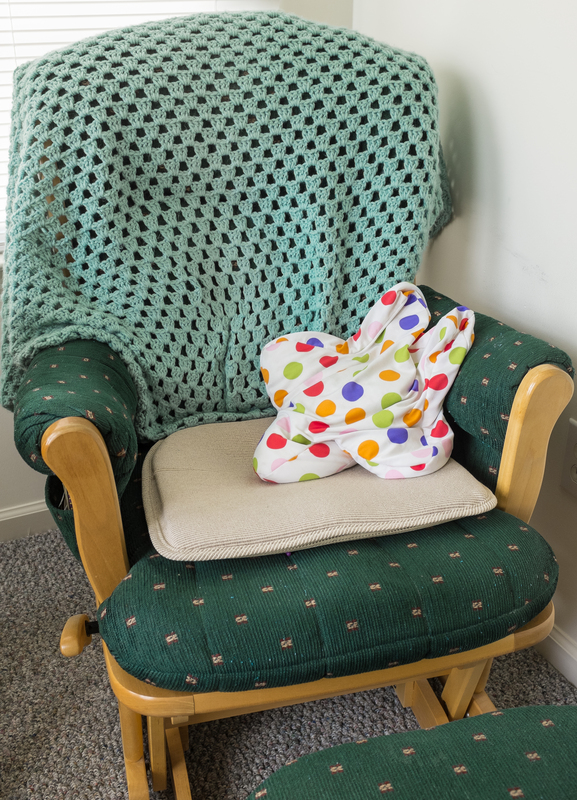 She lived (and died) in the same house they shared, his empty glider chair next to her. That chair was often occupied by visiting children, grandchildren, priests, and friends of all sorts who had come to love her sweet yet unyielding nature. I was pleased to sit in that chair many times and share another regretful Phillies loss, and once in a while a bit of triumph. She could argue ball players’ abilities as well as any guy, but for her it always came down to whether or not she “liked” the guy. Cole Hamels, she liked (I don’t) and in the end she kept asking me whatever happened to John Mayberry, another one she “liked.” When she and Dad were first married, she listened to daytime ball games on the radio and scored the game so Dad could review the box score when he got home from work. She attended West Philadelphia Catholic High School for girls at 45th & Chestnut. It was obvious in her perfect penmanship — the hospice admission nurse looked at her signature last week and said, “Oh, I know who went to Catholic school.” The same Immaculate Heart of Mary nuns who staffed her high school were the ones she trusted with her children at St. Teresa’s school in Runnemede, NJ. She said my father did not want to send his children to Catholic school — that cost money and as a young accountant, he didn’t make a lot. But mom insisted, so her children all went to Catholic schools. To help with the finances, mom took part time jobs in donut shops, dishing out coffee and sinkers to customers who came to know and love her quick wit and no nonsense opinions on everything. For the kids, her donut shop work was more than income for good private school education, it was the occasional gold mine of leftover donuts coming into the house. Choose carefully though, you only get one! By the early 1940s, Mom had become a “defense worker” at the Philadelphia Navy Yard. She and her mother were living in Bellmawr Park, NJ, a housing community developed specifically for defense workers. Each morning she would go to National Park and take the ferry across the Delaware River to work at the Navy Yard. After the war ended, the Saturday night dances at the Bellmawr Park community center began to fill up with returning soldiers, sailors and flyboys. My “flyboy” Dad was living in Baltimore then and working for the Martin aircraft company. One weekend he visited his brother, John, in Bellmawr Park. At the Saturday-night dance, he and Mom did a few laps around the dance floor, and he told her he wanted “two of her.” Being a good Catholic lad, he settled for one, and they married in April, 1946 at St. Anne’s Church in Westville, NJ. I joined them in 1947. Kathleen came to the party in 1948. Twenty months later, Janet signed on. Then came James in 1953 and Robert in 1956 and finally Joseph in 1961. One shy of a good baseball team we all were. 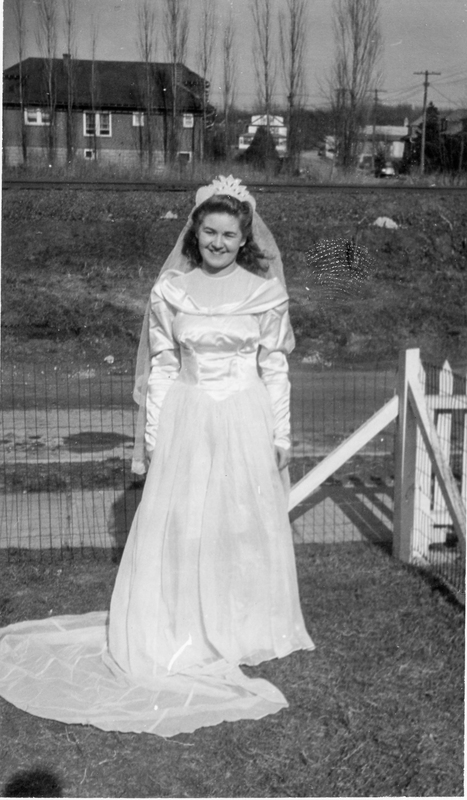 Mom’s wedding day, March 23, 1946. The Veterans Administration assisted with the purchase of a new home in Runnemede, NJ in 1953. 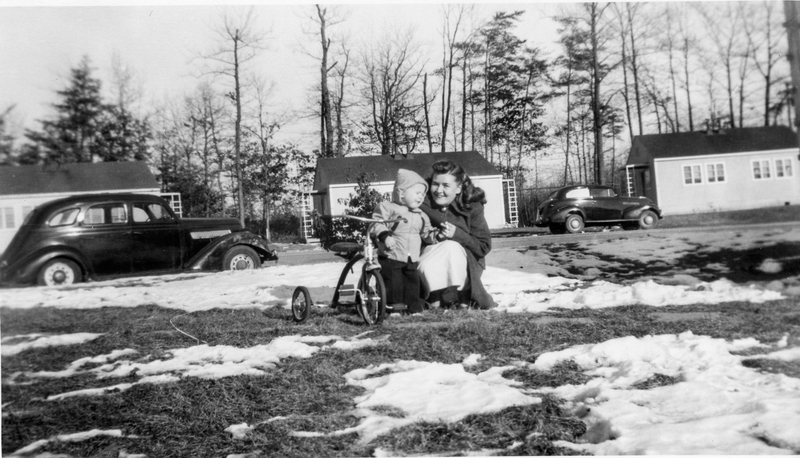 As a suburban mother of the 1950s, Mom’s life was cooking, cleaning and keeping up with growing children. A small television set broadcast “Search for Tomorrow” and “The Guiding Light” afternoon soap operas as Mom did her endless ironing. Those shows were preempted by the Army-McCarthy Hearings in 1954, so I’d come home from my first-grade classroom that spring and sit on the floor watching the political drama while Mom pushed the iron back and forth after sprinkling water on the clothes from a coca cola bottle. I can still hear strange men yelling, “point of order, point of order, senator” as the steam from the ironing hissed above me. On any given Saturday evening we would be with my Dad’s youngest brother, Basil and his wife, Edwyna, either at their house or ours. The jovial greetings always involved dad and Basil calling each other “Luke” and Basil calling my Mom “Suze.” I don’t know that any satisfactory explanation was ever given for the use of those endearments. An avoidance of the tender intimacy of real names? A family mystery for the ages, I guess. By the time most of the children were getting around on their own, we had moved to Pennsauken, NJ. Mom was deeply involved with the St. Stephen’s Church parish activities, school, etc. She did her part in carrying out the Works of Mercy, helping in any way as the parish fed the poor and clothed the naked and sheltered the homeless as best they could. I recall her getting personal about visiting the sick as she volunteered at a local nursing home. 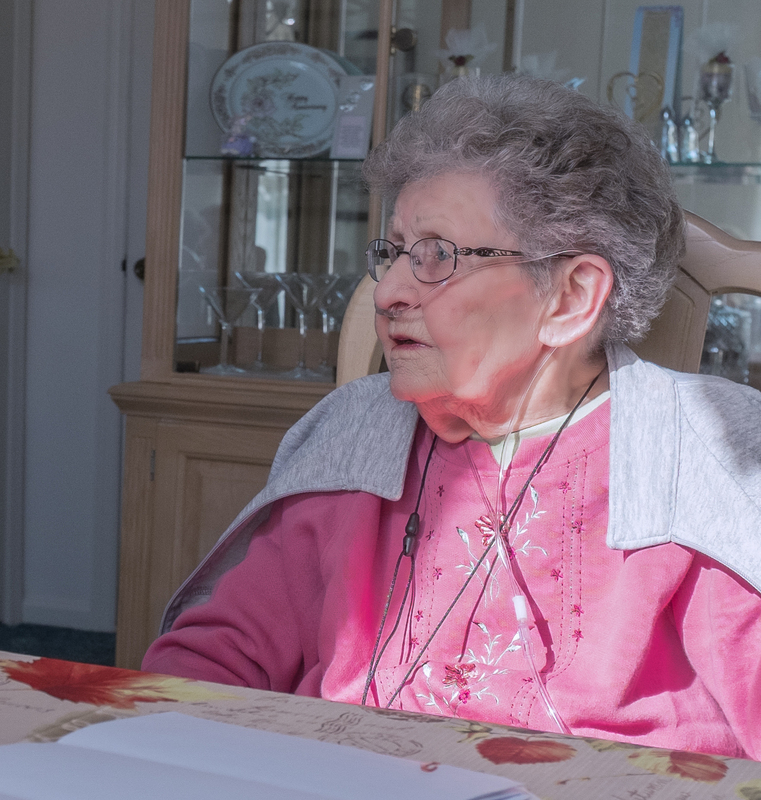 She developed deep and lifelong relationships with her fellow parishioners at St. Stephen’s. Even after moving from Pennsauken, she always considered St. Stephen’s her home parish. Mom with her first child, either living or visiting Baltimore, MD. By 1967 I had gone “flyboy,” same as my father had done. In July I came home on leave from the Air Force. Mom was there opening the door of my fire-engine red Ford Mustang as soon as I arrived in the street. Her joy was dashed when I announced I had orders for Vietnam. The first words out of her mouth were, “I’m not going to let you go.” All she saw was danger for her son, so war and country and all of that could be damned as far as she was concerned. But even Mom could not thwart the forces of powerful yet silly men at war. So I went to war, and she settled for sending cookies and cakes and letters — and worrying. When I got back, Dad was slowly building a new kitchen, and it turned into the headquarters of our antiwar efforts. A big poster on the wall proclaimed, “It will be a great day when the schools have all the money they need and the Air Force has to hold a bake sale to buy a B-52 bomber.” Father Bill Buchler from St. Stephen’s would hang out with us and we’d argue about U.S. involvement in the Vietnam war. 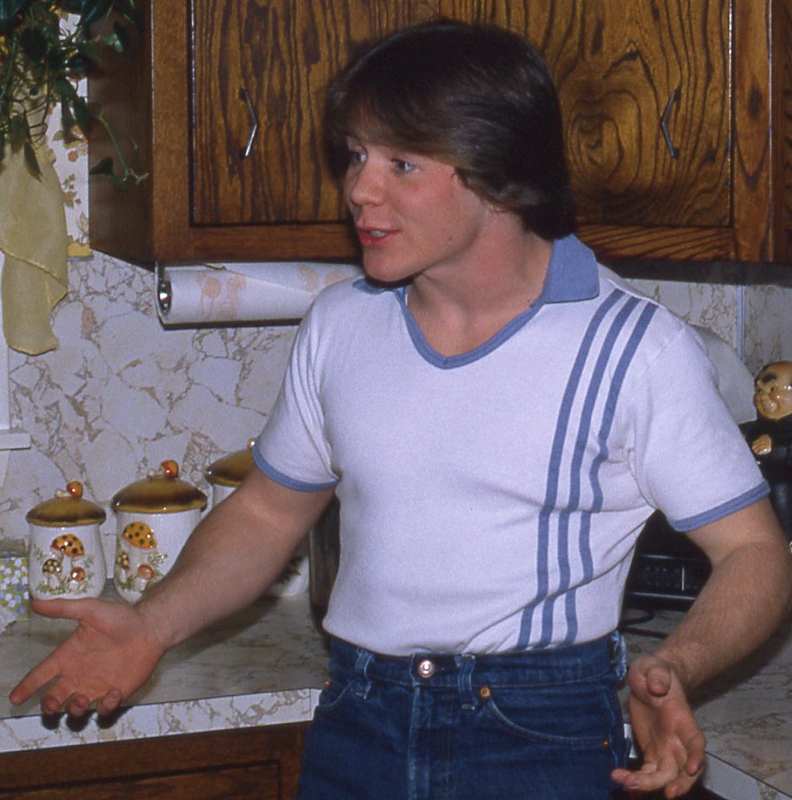 I proclaimed I’d take my younger draft-age brother, Jim, to Canada before letting him be sent over there. 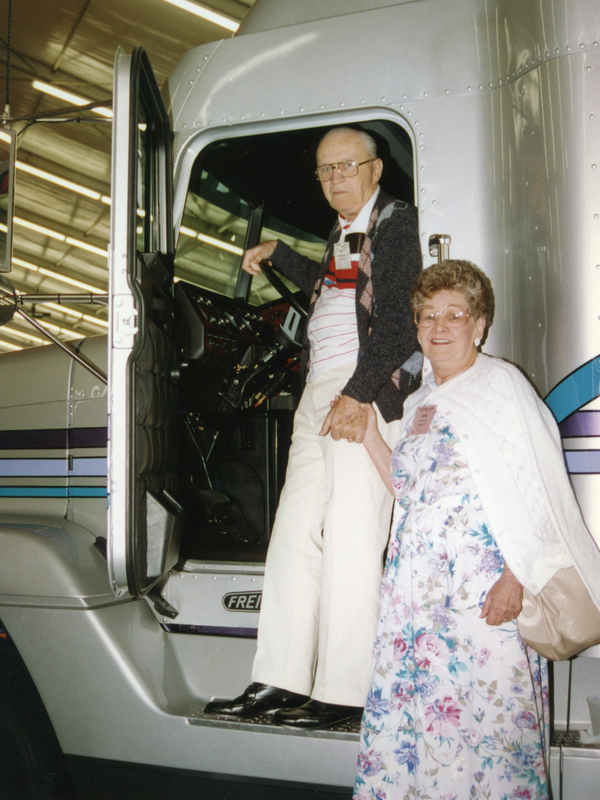 In retirement, Dad & Mom traveled. Here at a trucking industry trade show, checking out a new Freightliner. Dad and Mom got into retirement as soon as they could, he was around 62 and had organized things so they could spend their days together from that point on. They traveled where they liked. Mom had always wanted to go to the “Holy Land,” and I think she made a couple of trips. They visited Hawaii, another of her dreams. And she loved Ireland, where both the Tracys and Cullinans originated. They joined a competitive bowling league, made more friends and brought home trophies. They spent as much time as possible with family — children and grandchildren always at the top of the list. I don’t think Mom ever missed sending a birthday card or Christmas card to her many grandchildren and great grandchildren. No child should ever feel unloved or forgotten she believed, especially not her children! In 2007, Dad died rather unexpectedly. I came back from California for the funeral. I was surprised she looked so good, and she bounced around like a schoolgirl. While I had talked with her by phone frequently I had not seen her in eight years. Mom soldiered on alone the next few years, but back surgery finally handicapped her mobility. She gave up the bowling and some church activities. More and more she spent time in her comfortable glider chair, watching TV, receiving visitors, and clutching Joe’s pillow. I moved back from California in 2011. Since I’d gotten retired and was no longer married, it made sense to be back here near Mom. One of the best decisions I ever made. Over the last four years we’ve visited a lot, shared Phillies games and talk, argued politics and became better friends than we’d ever been. We swapped secrets. She told me things I never knew about her life. I told her things she never knew about my life. A wonderful intimacy developed. Joseph Tracy. Without him, there would be no pillow! Mom had smoked cigarettes most of her adult life. She knew about cancer so had taken up Kent cigarettes (with the micronite filter) in the fifties. But COPD finally got her (chronic obstructive pulmonary disease). Bronchitis and pneumonia are constant problems; we hospitalized her last year with pneumonia. Otherwise she was pretty healthy, and I often told her if it weren’t for the cigarettes she’d be riding a pony today. She would laugh and be grateful most of her kids had stopped smoking when young. Over the last few years she was able to do less and to get out less. At the end of each day, she’d say her prayers, get up, gently put Joe’s pillow on the chair and blow a good night kiss to Dad’s picture and Joe’s picture. I would sometimes be able to take her shopping for groceries. Since Dad did all the grocery shopping for her, she hadn’t spent much time in grocery stores. She’d put her little oxygen tank in the child seat of the shopping cart and push up and down the aisles in wonder. She’d look up at all the products as a child looks at a brilliant night sky for the first time. I loved seeing that. Eventually, she didn’t have the strength to go shopping. So every time I’d go to the supermarket I’d call and ask her what she needed or wanted. She’d never make a list so it took a lot of “interviewing” to remind her what she might need. Then when I got to her house with the groceries, she’d try to give half of them to me. “Here, you like these,” she’d say. 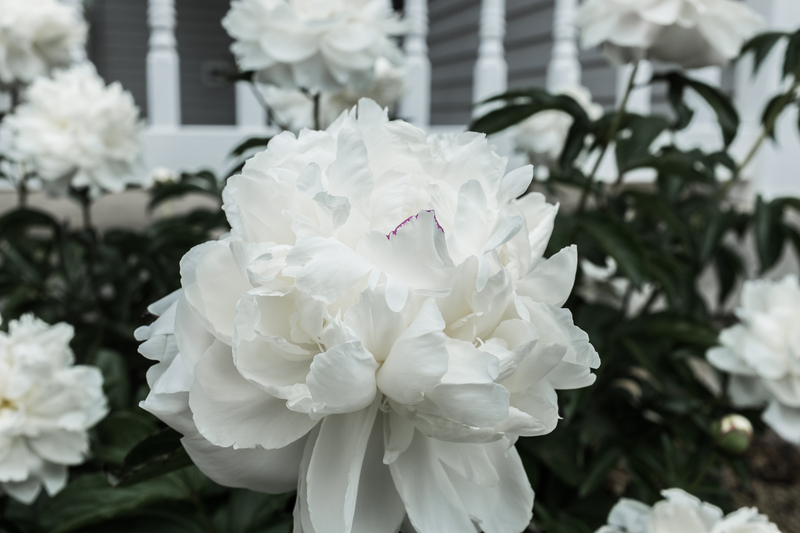 There seemed to be some significance to the white peonies in Mom’s yard bursting forth on the day she died. The end was much quicker, and easier, than any of us had imagined. Last week she left a doctor’s office and made a decision for hospice at home. 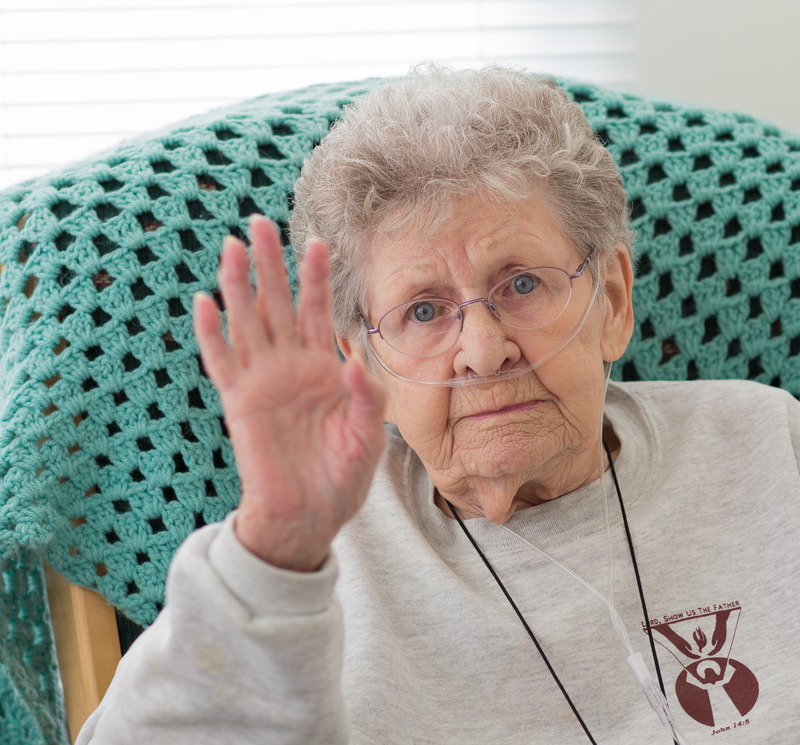 The next day a hospice admission nurse was at the house having her sign forms and explaining the process. “This is boring,” she proclaimed. Given the COPD I had a fearful vision of a torturous, suffocating death. Fortunately, the hospice folks really do know how to keep people comfortable in their last days. She was made comfortable, and in the final hours, she was peaceful, almost blissful. There was no pain or discomfort. Her breathing simply slowed as we all said our goodbyes. And she slipped away like a beautiful setting sun under the horizon, satisfied that she had brought light and warmth to all those she encountered in her journey through this realm. I love you, Mom. Thanks for everything!! « Hawaii? Or Something Else? My condolences to the family. Bob, I now know where your quick wit comes from. Such a wonderful story of love and family. Bill, that made me cry. I’m so sorry for your loss, but very happy for your mother as the kind of death you feared didn’t come to pass. The loss of your mother, regardless of age, is always earth-shattering, I don’t care what anyone says. Know that you are in my thoughts. Try to let the months and years to come be a celebration of her life.